There is something about a garden whether big or small, intricate or humble that infuses us with hope. Even the birds seem to know it. Yesterday after E. had restructured the watering system and dug up all the old dirt she sowed the seed that will produce fresh tomatoes and watermelon and fresh spinach and okra. Yes okra. This Yankee girl has fallen in love with the slimy vegetable that seems to be the red-headed stepchild of the vegetable world to hear others talk. I believe it’s all how you cook it. Douse it with a bit of flour and cornmeal and fry it up hot and summer comes to life. 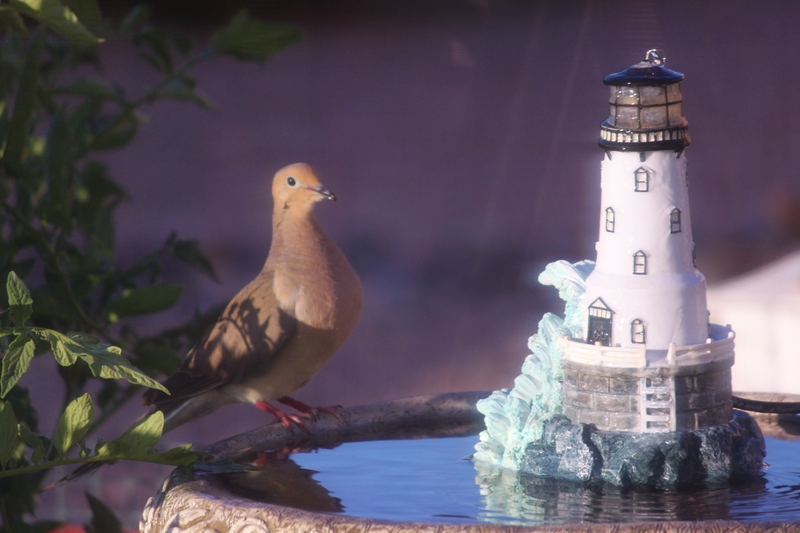 After the bubblers were turned on and everything was in good working order, the dove promptly hopped down between the furrows and started drinking from the fresh drips. It was almost like a confirmation that yes, this is a very good thing. Gardening in the desert is a particular challenge which makes the victory all that much sweeter when you start to see those shoots pushing up through the ground that you’ve so carefully cultivated. The artichoke plants on the side of the house are flourishing. As of yet, no artichokes…….but if last year is any indication there will be more than we can eat. This morning I went out and opened up the umbrella and had my coffee at the table. I arranged the gnome in his corner of the garden where he will keep watch….with his surfboard. He has a long wait for waves here in the desert. But he still hopes. A bit of my Aunt Esther also rests there in the form of a garden angel, a duplicate which E. made of the one she always had in her garden, which she loved. When I look at that angel, I think of her coming in after picking tomatoes, sweat rolling down her face which was easily as red as the tomatoes themselves. When you think about it, gardens are our heritage, handed down to us by God himself, the Master Gardener. Sitting by the garden I feel my roots, it’s a bit like coming home again. I think about my Grandma and Grandpa who could grow anything……I wonder if they ever imagined me as they sowed those seeds. My Grandpa’s favorite hymn was “In the Garden.” I think of him strolling along in the early morning hours, He and Jesus. I like to think he prayed for me. I can see him now, sitting in God’s own garden, surrounded by eternal light. As I sit here in this place, I feel his prayers. The earth waits in anticipation, now all we need is time. Someday I’ll join him, but until then I will visualize him here in this little place. He, and everyone who has ever planted a seed in hope of a harvest. A garden is the hope of salvation, a resting place and a promise of better things to come. This entry was posted in Uncategorized and tagged family, Gardening, Heritage, Hope, Nature, New life in Christ. Bookmark the permalink. ← I had a dream…….